This week I am expanding the definition of “pet” of the week in order to introduce you to a beautiful pair of bonded cats named Bella and Cholito. Cholito is an 8 year old orange tabby, who loves to rub his chubby cheeks on all new comers. His little sister, Bella, is only a year and a half, and she is a bit more timid until she knows you, and then becomes a playful, loving little soul. She is a magpie kitty, with lovely black spots. These two were in a family together their whole lives and would like to stay together as they leave our adoption center. They are looking for a quiet home with children over 10. 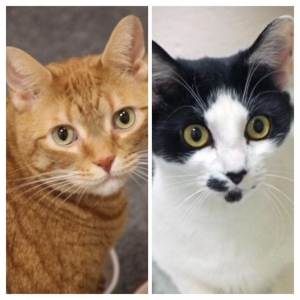 To learn more about these two, please visit our website at cthumane.org or come on down to our shelter at 455 Post Road E in Westport.